This illustration by Adam Turnbull is featured in Take Back the Economy. It’s not an end to capitalism that Buffet wants, just some humanism and, by the way, a “new operating system…something built from the ground up.” Buffet admits that he and his wife don’t have the answers, but they are ready to listen and to support “conditions for systemic change.” We think that Take Back the Economy might have some leads for how to produce such conditions. 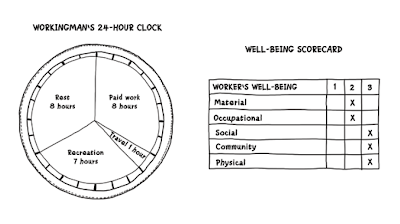 But perhaps we need to step back and understand why a clear beneficiary of capitalism’s private largesse might be so concerned as to ask for a new way to live. On countless philanthropic boards over the years, meeting with heads of state, investment managers and corporate leaders, he has become aware of the links between increased wealth and continued poverty. Buffet’s revelations imply a causal chain: economic activity generates inequality and allows for staggering fortunes to grow alongside human misery, a portion of this staggering fortune is then reinvested in starting new NGOs designed to address the problems generated or exacerbated by economic activity or rising levels of inequality. The charitable-industrial complex is peopled by investors who want to know if they are getting an adequate return on their investment (ROI), who clamor for statistics on how efficiently this misery is being addressed. In disgust Buffet comes to the conclusion that the charitable-industrial complex is ultimately little more than “conscience laundering,” a palliative fantasy that helps the rich to, in his words, “sleep well” at night. Quoting Albert Einstein, who said that problems cannot be solved with the same mindset that created it, Buffet asks what would a different mindset look like? One more attuned to humanism? One that sees a world free from child exploitation as progress, not a world that is one vast market where Wi-Fi is on every street corner? From our perspective, what Peter Buffet calls "humanism" certainly does have a place in how we think about, organize, and enact economies, but for us where that place is differs. Buffet clearly shows how ethical values are placed at the end of a chain of causal events: charities come in to clean up messes that have been made by business as usual. Moral judgment as to whether or not philanthropy has done a good job is applied after the fact, drawing on the same old thinking of ROI. Ethics here is at the end, not the beginning, of the process. No wonder people have little regard for it. in ways that align with our values. Putting ethics at the beginning of the process of organizing an economy is definitely a different mindset. Mainstream economics dictates that ‘moral sentiment’ has no place in the competitive business world. In our view, putting ethical negotiation at the core of economic activity and democratizing economies by inviting more people into the process of developing a new economy will create the new operating system that Buffet calls for and make that ‘other world’ possible. 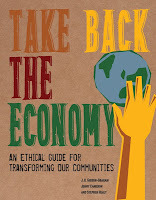 J.K. Gibson-Graham, Jenny Cameron, and Stephen Healy are authors of Take Back the Economy: An Ethical Guide for Transforming Our Communities. J.K. Gibson-Graham is the pen name of the economic geographers Professor Katherine Gibson from the University of Western Sydney and the late Professor Julie Graham from the University of Massachusetts, Amherst. Their earlier books include A Postcapitalist Politics, The End of Capitalism (As We Knew It), and Class and Its Others. 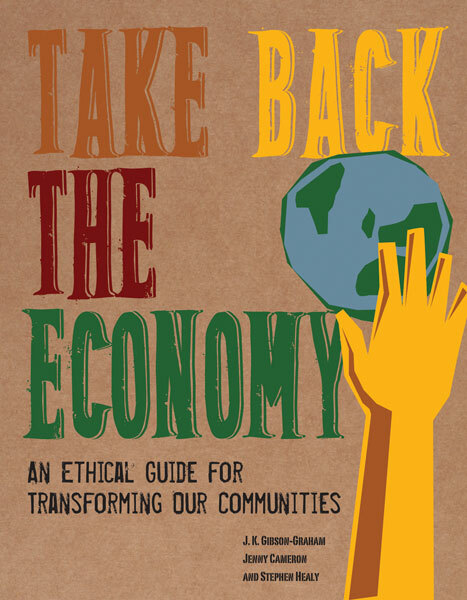 "Take Back the Economy is the single most farsighted and practical work enlightening us on the path to a steady transition towards a genuine postcapitalist world. It is based on the presupposition that reorienting the economy means much more than the control of production—it means reinventing ourselves, our communities, and our world in profound ways. 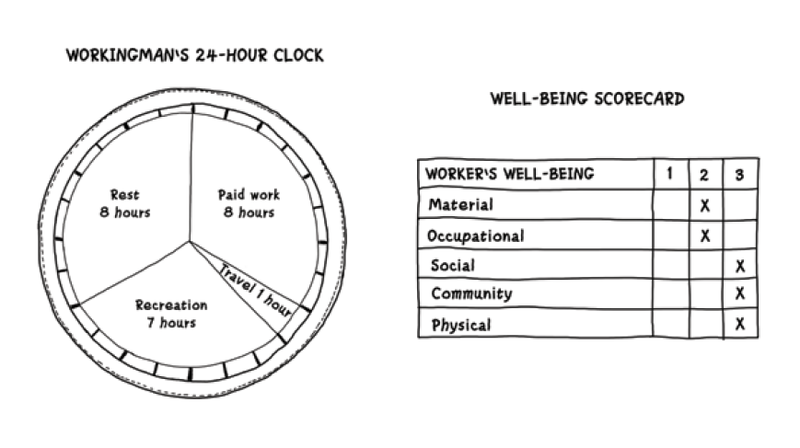 Out of this act of ‘reframing’ there emerges a novel understanding of work, enterprise, market, property, even finance. In this wonderful new work in the tradition of Gibson-Graham, students, activists, movements, and communities will find a toolkit for ethical and effective action any time, any place." There is an old answer to that old problem which has worked effectively in scandinavia and some parts of Europe. It is spelled socialdemocrazy, legal justice, public governance, independent media. Everywhere in the world where the U S is active in some supporting role it is always business interests that goes first. And that is understandable since business runs US politics top down. You have already some answers in our system, people propagating them, for one example so have Michael Moore done good description of social faults in the U S and does som suggestion for betterment. I think it is possible for a new system to grow organically from a society if it is given the possibility through instruments that give more power the structures I mentioned in the beginning.